If Fields Are Deeper Than Ever, Why Does An 18-Player Event Award More Points Than Some Prestigious Full Field Stops? The Hero World Challenge has been offering Official World Golf Ranking points since 2009 and the move has been questioned every year since. That’s pretty remarkable in an attention-deficit world where most controversies have short lifespans. The winner of the Hero World Challenge receives 48 World Ranking points this week, the same as this year's Houston Open, CIMB Classic, Dubai Desert Classic and Scottish Open. 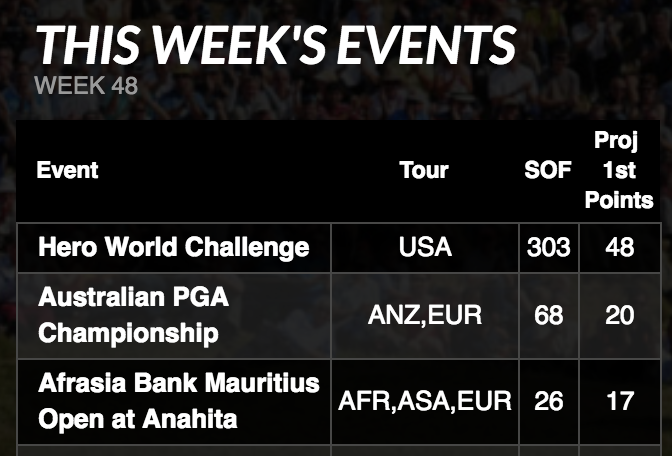 The events mentioned by Ray were all full field events except the CIMB, which still is three times as deep compared to the 18-player Hero World Challenge. Each of those events could be considered a prestigious title with generally deep (enough) fields to be very competitive. Given the common modern-day refrain that there have never been more players capable of winning, logic would suggest there be a world ranking point divisor of some sort for field size. As stacked with top players as the Hero World Challenge fields have been since they could pick up easy points, it’s still a tiny field at the end of the season when some are putting in less than their best effort. The resulting sense of a rich-get-richer vibe is the greater issue here given that this is unlikely to impact the even more important ranking perks in the 40-60th slots. But the annual debate also takes away from the event and undercuts the Official World Golf Ranking’s credibility. Is "World No. 1" Status Enhanced Or Diminished By Recent Revolving Door? Brooks Koepka won the limited-field CJ Cup Sunday in Korea and while no one noticed in the United States due to interest in many other sports not named golf, I do wonder if Brooks Koepka’s move atop the Official World Golf Ranking is impacted by the recent changes at the top. As Dan Kilbridge at Golfweek notes, Koepka is still very much grinding to bring his major championship consistency to regular PGA Tour events and is proud of the honor. But given that Dustin Johnson and Justin Rose (ever briefly but long enough to cash some bonuses), held the title of No. 1 in recent weeks, does that lessen the impact of the achievement or speak to unprecedented parity and therefore the difficulty of reaching the top ranking? In just a glance through the biennial U.S. and World lists, it sure looks like the panel is going full anti-Golf Digest and rewarding shorter, cooler, classier golf architecture in similar fashion to the Golfweek's annual list. Pure restorations as opposed to redos defacing the old architecture, also appear to be stylish. The real standout for me: Prestwick cracking the world Top 100, a fantastic exclamation point to the aforementioned trends. And nice to see this week's Walker Cup host at its highest ranking ever, arriving at 13th in the U.S. and 22nd in the world, even edging out that South Korean masterwork, Nine Bridges. The (2015) Rankings Are Out! The (2015) Rankings Are Out! So much to line your birdcage with all at once! What to do? Save the ink cartridges. You longtime readers know how I feel about the course rankings that are too high on experiential factors and depressingly low on timeless design appreciation. But to recap: Golf Digest's still doesn't carry the weight it should because the list includes Resistance to Scoring as a category, which might as well be called resistance to fun, resistance to character and resistance to soul. Imagine a ranking of great films rewarding only those that run over three hours, or saying great restaurants get points for difficulty of making a reservation. The big news this year: Augusta National overtook Pine Valley for the top spot this year. Neither reflects the brilliant vision of their founders who are held up as saints at both clubs. Yet neither is worthy of being known as the best course in America after letting Tom Fazio inject his special brand of mediocrity and his shameful lack of understanding of the foundation and soul of Bobby Jones and George Crump's creations. Architecturally, The National Golf Links of America is on another level right now. And it won't surprise you to learn they have not had a Fazio on the property to do any damage. Then there is Golf Magazine, which debuted its World Top 100 a day after Digest this year and, while generally more in line with my architectural tastes, adds two courses that no one but royal family members can or would be ignorant enough to access. These are (literally) private courses that almost no one will ever see. One in particular is an embarrassment to the idea of semi-refined golf architecture, with a ranking inclusion so clearly out of place (attested privately by horrified Golf Magazine panelists) that it devalues the entire exercise by its very inclusion. Just a few quick reactions to the latest Golf Digest America’s 100 Greatest Golf Courses. The list and accompanying package of images, sidesbars, etc...appears in the February, 2015 Golf Digest. - Augusta National switches spots (again) with Pine Valley, though the plunge to second probably won’t be alarming enough for Pine Valley to initiate some much needed restoration work. Nor does a move to No. 1 do anything to inspire much needed restoration work at Augusta National. First world sigh. - National Golf Links finally lands in the top 10 at No. 8, no doubt helped by hosting the Walker Cup and the magnificence of the design. Top 2 with a restored Pine Valley is where it should ultimately land, in an ideal world. - Oak Hill actually moved up from 17th to 16th. Is it even the 16th best design in the state of New York? Great club, but architecturally it has no business anywhere near the top 75. - The Country Club moves from 24th to 19th, a nice nod to the club restoring features under Gil Hanse’s supervision and hosting the U.S. Amateur. - Friar’s Head moves to 23rd from 28th while Sand Hills drops out of the top 10. With the continued effort to improve Friar’s Head by overseer Ken Bakst, this may ultimately turn out to be Coore and Crenshaw’s most complete design. - Los Angeles Country Club moves to 26th from 41st, the biggest jump by a classic course that I could detect. - The Alotian Club begins the descent from the ridiculous 15th to a still-inflated 27th. - Pinehurst No. 2 vaults to 28th from 40th. Better, but still should never even be mentioned in the same breath as a place like The Alotian Club, much less sitting behind it on a list. That's like putting Caddyshack behind The Greatest Game Ever Played. - Erin Hills debuts at No. 42. The course had been ineligible for consideration until 2013 due to Architecture Editor Ron Whitten’s involvement. The course hosts the 2017 U.S. Open. - Seth Raynor and Charles Banks’ Camargo Club joins the list at No. 52, fueled by a Tom Doak restoration. - Somerset Hills, my favorite A.W. Tillinghast design by about ten lengths, moves from 95th to 73rd. Still not good enough, but I’m sure the late, great Frank Hannigan would be concerned to see the Golf Digest panel gradually coming to its senses. - The Valley Club of Montecito is back! 112th to 83rd. I’m not sure what happened but one of the most enjoyable courses on the planet should have a spot on such a list, right? - Streamsong’s Red course cracks the list, as does Shoreacres in the final two spots. The omission of Shoreacres was always on the list of reasons to not take the ranking seriously! Overall there appears to be a little more recognition of fun and whimsical design, and even more acknowledgement of restored features. There appear to be still too many courses recognized because they are difficult or provide a lavish experience. That said, I see mostly huge positives thanks to the upward trajectory of long overlooked courses and those with genuine architectural interest. It seems like inside-the-Beltway stuff but the Masters exempting the Official World Golf Ranking's top 50 has many ramifications, most of them negative. Doug Ferguson makes a case for the Masters taking the top 50 closer to the tournament. The top 50 at the end of the preceding year received invitations, along with the top 50 a month before the Masters. Starting in 2003, the final cutoff was moved to one week before the Masters. The club has never said why it takes the top 50 at the end of a calendar year. Perhaps it's so players can make travel arrangements, or perhaps it was to give an advantage to overseas players, who compete deep into the year. PGA Tour members have more avenues to qualify throughout the season. But imagine what would happen if there was only one cutoff for the top 50 in the world, and it followed the Florida swing. Matteo Manassero (51), Branden Grace (57), David Lynn (65) and Peter Hanson (70) all were in the top 50 in December. They would have spent the Florida swing trying to stay in the top 50 or move back in. That change might be something for Augusta National to consider if it feels the field is getting too close to 100 players. The full list is up at GolfDigest.com. I was pleased to see LACC North and Pinehurst #2 move up after getting mistreated by the panel in last year's American list. Quibbles? I had few despite reading some outrage over the list. I can't speak for the selections in China, South Africa and South Korea, but it was a pleasant surprise to see the panel reward a surprisingly high number of shorter, funkier classics (Swinley Forest, Victoria, Cruden Bay, North Berwick) that are generally penalized by the Resistance to Scoring mentality (and criteria). Longtime readers know I admire the Golf Digest panel's sensitivity to classic design much in the way a Benihana chef treats a piece of shrimp with love and care for his audience. Of all the rankings Golf's panel seems to select the fewest courses that make you pause and say, "Really?" Yes it's very America-centric and Trump International Scotland landing in the top 50 when it's probably not in the top 50 Scottish links you'd enjoy playing, helps distract from the strange infatuation the list has with South Korea's Seven Bridges. Nonetheless, Golf presents a timeless architecture-focused list presented with images in gallery form, starting with the world 1-25. They've also posted the top 25 U.S. courses. With Stacy Lewis's win in Singapore, she's moving in on top ranked Yani Tseng, who lamented the "No. 1" pressure in an unbylined wire story. "It's tough and it's very lonely," she said. "No one knows how do you feel. Everybody wants to be in your shoes, but no one knows how tough is that." "The first year, when I was world No. 1, I feel good. But every month, everybody keeps building the expectations on me and that's lots of pressure." "World No. 1, I know it's good and people like it, but I want to care about myself more," she said. "If I lose (it), I'll get back one day, too." Meanwhile Joe Posnanski writes about the "crippling" pressure created by a pesky algorithm putting a "1" next to your name. These guys are pros, of course, and they train themselves to not think about any of this, to keep their thoughts positive and their visualizations clear … but it isn’t easy. And then, suddenly, a player is No. 1. And it all explodes. Every putt is world news. Reporters are everywhere. Everything you say is a headline, every opinion you offer (about golf or not) is analyzed and scrutinized. Expectations are insane – a bad round leads newscasts around the world. Whispers surround you. People invest hopes in you. It’s a lot to deal with. It’s hard to keep your bearings. Jack Nicklaus – who handled the No. 1 spot in the world better than anyone in golf history – said it best. Today's trivia question readers, how many weeks did Jack Nicklaus spend in the World No. 1 spot? Really, why do people take the golf rankings so seriously? I understand players wanting to get in the top 50 Club because of the perks that go along with it, but this is not tennis. Does the Official World Golf Ranking even come close to consistently telling us who is playing best in the world? "I've never heard of Roger Federer complaining or lamenting about being world No. 1. In golf I think we need to take a page from other sports' books, so to speak, and get that competitive fire back. What are we doing?" ...with capsules and photo(s) for each course. ...arrives a little early! I'm not sure why the change, but what normally comes out three months from now is on newstands or on tablet editions for subscribers (or single issue downloaders). Pictured is No. 15, The Alotian Club where they appear to have replicated the Great Wall only as a cart parth embankment. That said, here is the top 20 for online readers where Pine Valley moves back ahead of Augusta National in the top spot. Sean Martin explains how Thorbjorn Olesen's inactivity helped him crack the top 50 in the year's final Official World Golf Ranking and therefore earning his first Masters bid. Geoff Ogilvy just missed the coveted top 50 ranking and all of the perks that come with it. How did Olesen pass Ogilvy? Players are ranked in the OWGR based on average points earned per tournament in the past two years. Points earned for a specific finish decrease as time passes from that tournament; that loss in points is the reason for Ogilvy's fall in the rankings. Martin lists the other beneficiaries of the top 50 club status. I don't usually get too excited about a new list but Golf Digest's 50 Most Fun is one that could actually have a positive impact on the game. It never hurts given I've only been associated with two courses that were created and built from scratch working with Gil Hanse and Jim Wagner, to see Rustic Canyon (#30) and The Horse Course at Prairie Club (#10!) making the 50 Most Fun publics. The 50 Most Fun Privates, the 50 Most Fun Publics, and the most fun of Great Britain and Ireland. "The Official World Golf Rankings are significantly biased against members of the PGA Tour." A Worse Case Scenario For The OWGR: Voting!